In demystifying what has been argument fodder for over 200 years, religion scholar Holmes (A Brief History of the Episcopal Church; A Nation Mourns) sorts through the carefully constructed (and ambiguous or contradictory) versions of the personal beliefs the United States's founding fathers presented to the outside world to present a sound case for what George Washington, Thomas Jefferson, Ben Franklin and others did or didn't do on Sundays. Holmes's subjects were acutely sensitive both to the dangers of state-sponsored religion as well as their reputations as leaders and went to what might seem like absurd lengths to cloak their religious leanings (Washington, for instance, rarely mentions church in his journals and, when he did attend, would leave service prior to communion), making Holmes's research and conclusions feats of deduction based on clues gleaned from letters, government documents, second- and third-hand accounts and educated speculation about motivations. 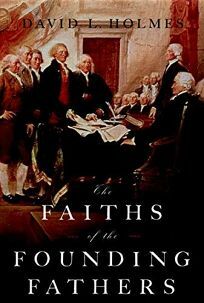 Despite its strong points (including a wonderful epilogue on the religious beliefs of presidents from Gerald Ford to George W. Bush), the desiccating tone is one of technical scholarship that may turn off casual readers looking for a narrative history of this hot-button issue.